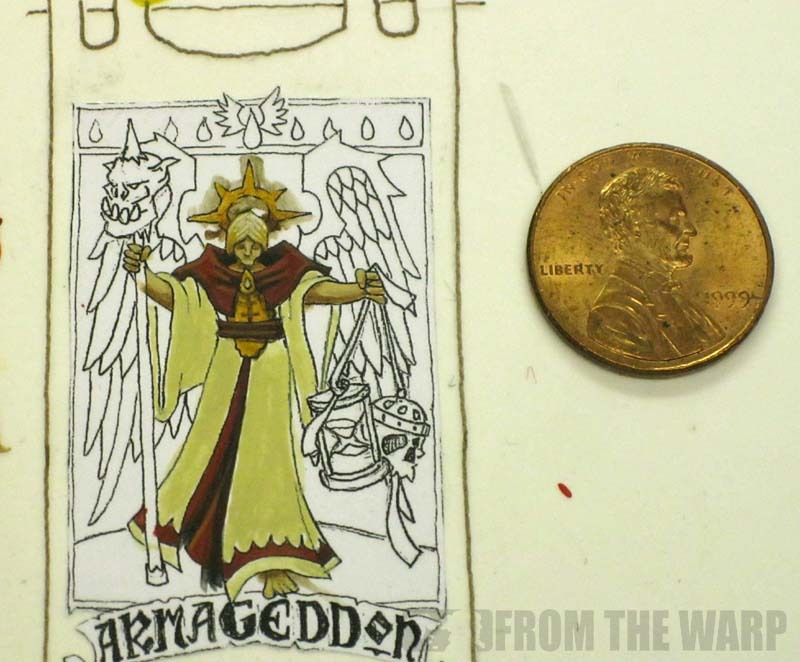 Being given the opportunity to draw the Blood Angels Armageddon banner is quite an honor. It's not something you want to mess up. When I was given the task, the first thing I did was my research. Only then did I sit down and start working on the actual painting. 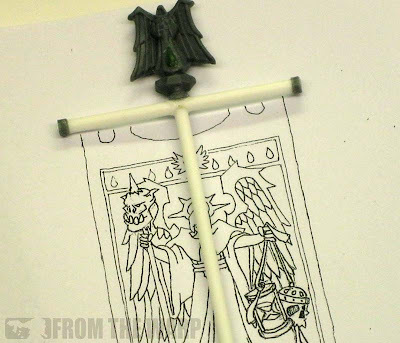 The process I used to build the banner is that same one I've used before outlined here. I've found this to be one of the best ways to do them for me. Building the banner pole was different this time since I used a new method. I'll cover that later on in the post. First though, I'd like to talk about some of the imagery found in the banner itself. The overall design comes from the Blood Angels Codex and follows what I believe is their practice of showing Sanguinius equipped with certain weapons and equipment based on the battle the banner is to represent. Once I had the overall idea, the big question became, "What weapons and equipment do I give him?" I decided on the spear with the Ork head as a way of showing it was to be the end of the Ork invasion and this was to be the outcome for the Orks. In his other hand, I gave him an hourglass and a skull. The hourglass is to show that time is running out for the planet, it's inhabitants and most of all, the Orks. Saguinius has come to judge them by the power of the Emperor and their time is at hand. The skull is there to represent the fallen population. The planetary defenses, Imperial Guard and all of the inhabitants of the planet that have paid a dear price that should not be forgotten. Across the bottom are three smaller elements. A scroll, a Terminator honors badge and a constellation. The scroll outlines the Emperor's words as to the fate of the planet and at who's hands it shall happen by. The honors badge is to show that this banner above all others is the rally point for all forces. This one does not fly a number for it is the only one like it. And the constellation... for those with the old Armageddon Codex, you can go back and see that it is the actual layout of the system in which the battle has taken place. I deliberately chose black as the predominant color. You don't see it often and I'm hoping it really stands out against all the red in the army. I also kept the colors warm so that it did tie in with the rest of the force. Cool colors would have made it seem out of place. 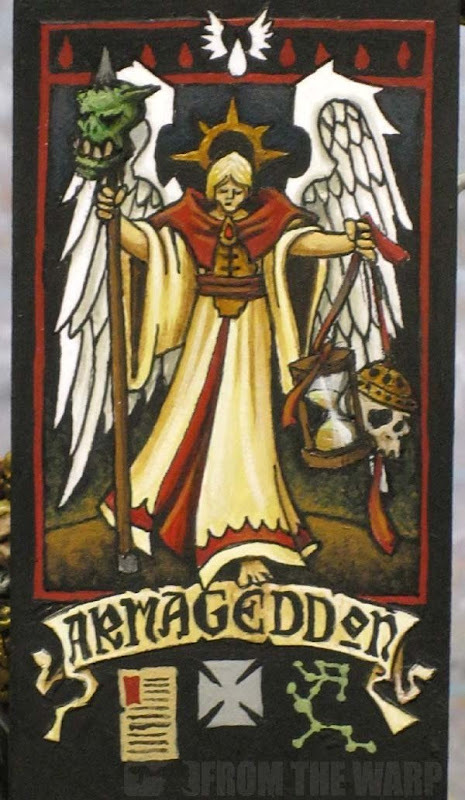 The background behind Sanguinius is made up of browns to represent the sulfur yellow skies and the orange-red ash wastes mentioned in the Armageddon Codex. It stands a full twice as tall as the Terminator armoured Marine holding it. there is no way you are going to miss this thing on the table. I mentioned before that this guy is going to draw considerable fire from the enemy on looks alone. Here you can see just how small the detail on the banner is. The penny next to it would cover up Sanguinius completely if placed over him. It's not too hard to get detail that fine if you have a good brush and a system for painting it. It comes down to a base color, a shade and a highlight. Each part of the banner has that. It's my formula for working through the pieces of the image. Overall, this is painted to just above tabletop standard. It's possible to go higher, but the model himself is done to a tabletop level as well. There comes a point when too much detail will make it look out of place just the same. And last but not least is the banner pole. My normal method has me using 1/16 aluminum tubular stock, but I ran out this time. With the deadline fast approaching, I needed to try something different. A quick swing by my FLGS (Game Vault) and I found some .080 plastic rod by Evergreen Scale Models as a substitute. I think it actually works better than the aluminum I was using before. It's the same diameter as the plastic GW banner poles and it allows me to work with it much easier than the other material did. I was able to cut a groove into the top of the vertical bar in order to nest the horizontal cross bar into it nice and snug. The icon on top has also been grooved to sit comfortably on the horizontal bar as well. With some additional support by way of the banner itself and some assorted elements on the back, it's sturdy enough for regular game play. Getting it attached to the model was as simple as drilling the correct size hole through the left powerfist hand of the Terminator and sliding it through. And there you have it. My version of the Blood Angels Armageddon Chapter banner. I think it does a good job of representing the battle and includes appropriate imagery throughout. I'd like to think I hit the mark on this one and my Wife seems to think it's one of my better pieces as well. Hopefully it's something the winner of the Blood Angles army will be proud to use in their force and will enjoy playing with it as much as I did painting it up. If you still haven't contributed to the project, it's not too late yet. Check out the Heroes of Armageddon site and contribute today. Who knows, you could be fielding this guy in your new Blood Angels army. Next Monday, I post pics of the finished model. I Wish i could paint like you mate, good job! 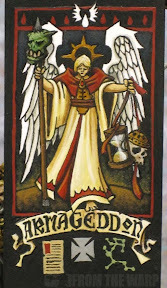 I love the banner; and would like to give it to my armageddon force as well if I may. I think we should have had you give a way a banner. Wow Ron, that is fantastic! The completed model will get posted tomorrow morning. grifft: You're right, not many people know about or use the campaign badges anymore. I guess it's one of those things that has died with the background as it's been rewritten over and over through different editions.